Mildred Miller, 91, of Napoleon, Ohio, passed away peacefully on Sunday, March 31, 2019 at Genacross Lutheran Services, Napoleon Campus, surrounded by her loving family. She was born on November 22, 1927 to Alvin J. and Luella (Bergstedt) Miller of Gerald, Ohio. On July 7, 1946 she married the love of her life, Eldor H. Miller who preceded her in death in August 31, 1991. 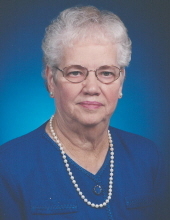 Mildred was a member of Emanuel Lutheran Church of Napoleon. She looked forward to going to church every Sunday and spending time with the congregation. Mildred worked at J.R. Winter and Frigid Queen (Peewees) for some time. She volunteered at Together We Can Make A Difference. She enjoyed watching baseball and football and cheering on the Buckeyes. She liked to listen to Polka music and fishing. She enjoyed traveling with her sisters and playing cards with them. Mildred was also a member of the American Legion Auxiliary Post 300 of Napoleon. She is survived by her children, Connie (Paul) Long, Thomas (Marsha) Miller, Nancy (Ron) Kruse, Debra Fletcher and David (Tammy) Miller; 13 grandchildren and 21 great-grandchildren. She is also survived by one great-great-granddaughter. She is preceded in death by her parents, Alvin J. and Luella (Bergstedt) Miller, husband, Eldor H. Miller, daughter, Linda Scharf, great-great-grandson, Bryson Davis, and her son-in-law, Dennis Fletcher. She is also preceded in death by her siblings, Olga Kruse, Esther Fouts, Lorna Bostelman, Ruth Bostelman, Eleonora Koppenhofer, Betty Botjer, Harlan Miller, Vernon Miller and Donald Miller. Visitation for Mildred will take place on Wednesday, April 3, 2019 at Snyder-Wesche-Hoening Funeral Home (830 N. Scott St.) of Napoleon from 2 p.m. to 8 p.m. Funeral services will take place on Thursday, April 4, 2019 at Emanuel Lutheran Church (810 Scott St.) of Napoleon at 11 a.m. with one hour visitation prior to the service. Burial will immediately follow the services at Riverview Memory Gardens of Defiance. Memorials in Mildred's memory may be made to Emanuel Lutheran Church of Napoleon. To send flowers or a remembrance gift to the family of Mildred Miller, please visit our Tribute Store. "Email Address" would like to share the life celebration of Mildred Miller. Click on the "link" to go to share a favorite memory or leave a condolence message for the family.